The next release of Toad for Oracle is right around the corner and, as ever, we have some exciting things to tell you about! We have a number of key features which will exploit Oracle Database 18c as well as some enhancements to our PL/SQL debugger. Also, with new challenges around identification and encryption of personal data as a consequence of the European General Data Protection Regulations (GDPR) that were introduced in May this year, we are also providing some features which will make it easier for DBAs and developers alike to deal with personal data as part of their company’s “Privacy by Design” responsibilities. We introduced some changes to the way Toad Freeware and Trial work in our June release, but I thought I’d include a reminder in this blog in case you missed it. Our Toad Freeware continues to be extremely popular so, for all you freeware users out there, you’ll love this! 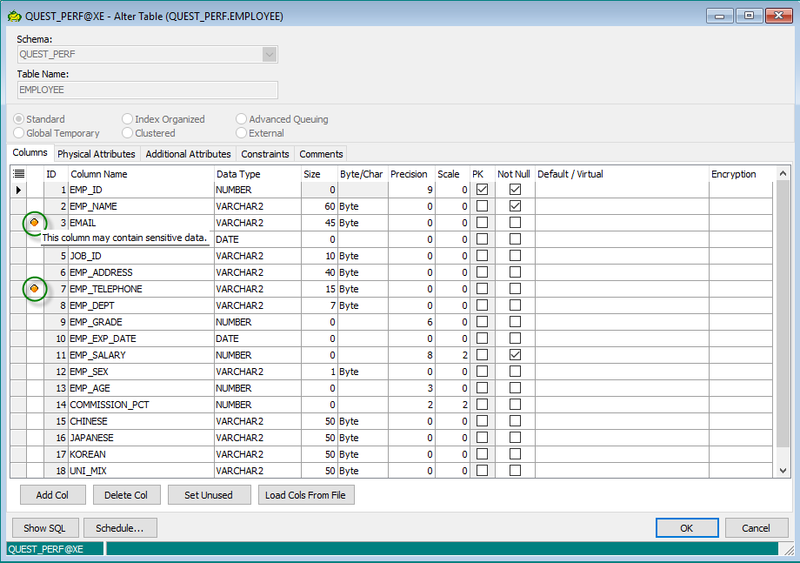 The first 30 days of Toad Freeware use will give you full access to all the features in Toad Professional Edition plus all the features in the DB Admin Module. After that time, the freeware will revert to its usual mode showing the Base Edition features. If, during your use of Freeware you would like to evaluate the commercial features again, you just click the Toad for Oracle community link which takes you to Toad World where you can click the Downloads button to download a Trial version. It might be that you don’t have enough time during the 30 day evaluation period to fully explore what Toad can offer. Currently, the Toad Trial would simply stop working after it expires and you’d have to go get another Trial. What will happen now is that Toad will revert to Freeware mode, which means you can carry on doing some limited evaluation, until you receive your new Trial license which you can enter into Toad’s Licenses window and be up and running again without having to download another Trial version. OK, so onto the new stuff! Migrating to Oracle Database 18c? We’ve added a number of features which exploit some of the new features in Oracle Database 18c. Enable Lost Write Protection and specify Shadow Tablespace - For an 18c database, you can enable shadow lost write protection and specify a shadow tablespace to be used. Inmemory compression for external tables - Inmemory compression is now supported for external tables in Oracle 18c. Create snapshot and create pluggable database from snapshot - In Oracle 18c you can create a snapshot in a pluggable database. You can also create a pluggable database from a snapshot. We’ve also provide additional support for Oracle 12c R2 and 11g R2 to exploit additional features. Please read the Release Notes for further details once the product is GA. Throughout Toad’s history, the PL/SQL debugger functionality has been supported by Oracle’s DBMS_DEBUG package. However, Oracle have deprecated support for the DBMS_DEBUG package as part of the Oracle Database 12c R2 (12.2) release, and recommend using the DBMS_DEBUG_JDWP package instead. In this release of Toad, you now have the option of using either. 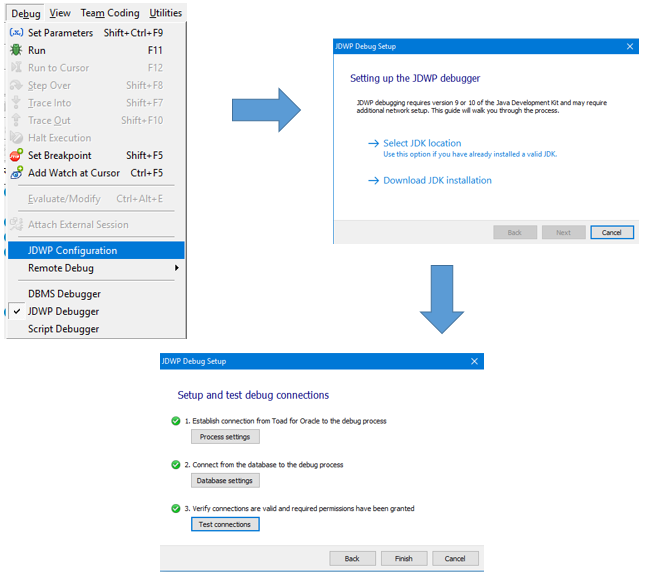 Setting up Toad to use JDWP debugging requires some setup changes and these are simplified using a brand new wizard which walks you through the necessary steps and checks your environment to make sure it’s properly setup. So far as the actual debugging workflow is concerned, there are no changes so you won’t see any differences to your Toad debugging experience. As a DBA, I’m sure you are probably aware by now there’s been a lot of recent press coverage around data breaches and access to personal data. You may also have heard about the new European General Data Protection Regulation (GDPR) legislation that went into effect on May 25th this year. The maximum penalty for non-compliance is 4% of annual revenue or €20 million, whichever is higher. Lower fines of up to 2% are possible for administrative breaches, such as not carrying out impact assessments or notifying the authorities or individuals in the event of a data breach. This puts data protection penalties into same category as anti-corruption or competition compliance. You might be asking yourself, so what do I need to know and how do ensure our business is protected? The first thing you need to consider is one aspect of GDPR called “Privacy by Design”. This requires a fresh look at how you should design your systems with data privacy as a priority. This starts with data discovery. How do I know what data in my databases is “Personally Identifiable Information” or PII? 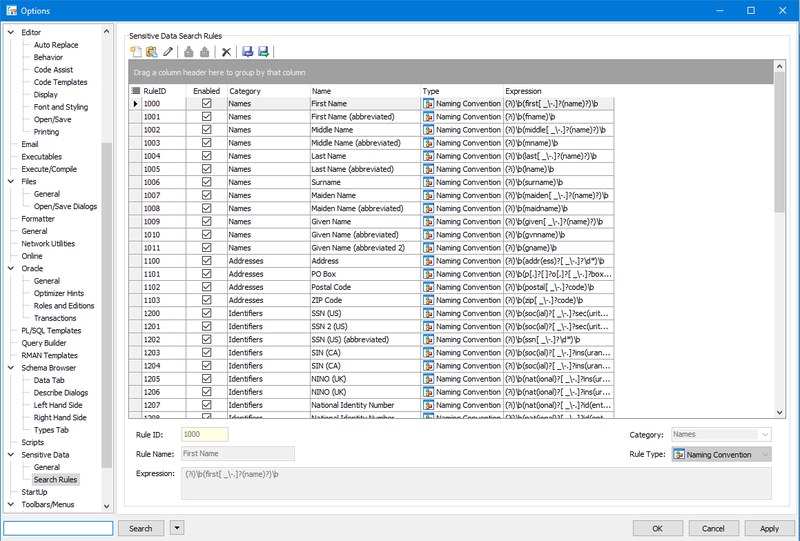 In the new Toad Options window, you can use some of the pre-defined rules to determine what types of sensitive data you need to identify or you can modify or even create your own rules. Having selected which rules you want to use, you can now expose (via orange markers in the left gutter) where table columns are being used which could contain sensitive data across your databases as you can see in the Alter Table script below. After discovering where sensitive data resides, the next step would be to decide on the most appropriate course of action to protect this sensitive data from unauthorized access. Do you use Oracle’s Data Redaction feature or go for data encryption using Oracle’s Transparent Data Encryption features? Toad already leverages these features as a part of the DB Admin Module. You will also be able to export a report containing the results of the search. The Sensitive Data Search capability will also extend the existing DB Health Check feature (DB Admin Module). Since both Sensitive Data Search and DB Health Check can be automated, it means you could include this capability into your DevOps Continuous Integration/Continuous Testing process. Although these capabilities don’t form a part of this Toad release, they are coming soon, so watch this space!! Get up to date now! Make sure you're on the current version of Toad for Oracle. If already own Toad for Oracle, but would like to evaluate a higher edition free for 30 days, please click here. 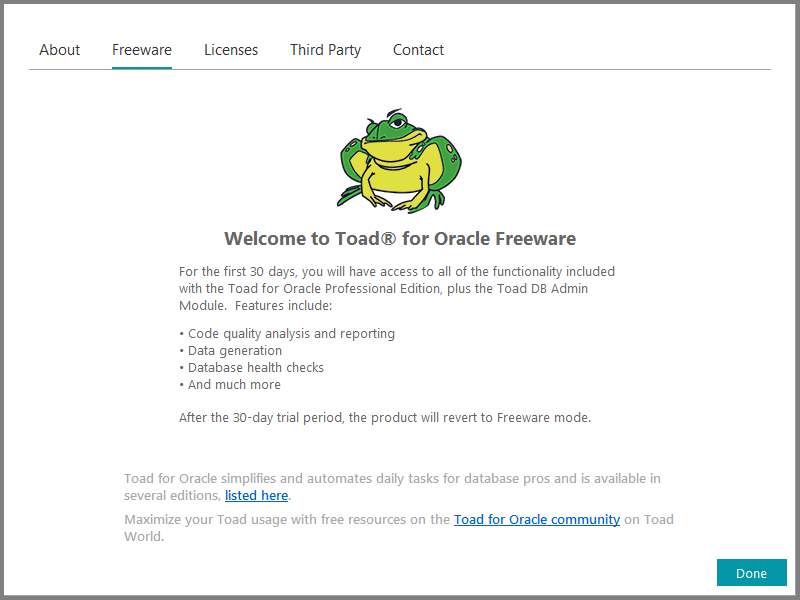 If you don't yet own Toad for Oracle, please click here to download a free Trial version for 30 days. We hope to see you at Oracle OpenWorld! As usual, we will be exhibiting at this year’s Oracle OpenWorld conference in San Francisco from October 22 – 25. We are in the Moscone Center at Booth 4201. For more information about what you’ll see if you are attending, click here.